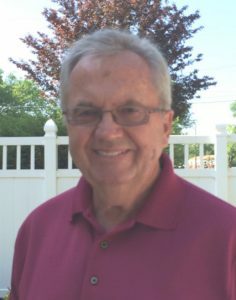 We are at once delighted and disheartened to announce the retirement of Dennis Bowman, Resident Project Representative. Dennis has been a consistent and loyal employee who is regularly requested by clients. After 44 1/2 years of loyal service, we congratulate and thank him for his dedication. Pictured right, is Dennis. We would also like to recognize Bill Davis, a draftsman in the West Tennessee Office, for his 12 1/2 years of service as well as J.D. Watson, Resident Project Representative, for his 15 1/2 years of service both of whom retired in January. Best wishes to each employee and enjoy your retirement! The annual meeting of the TENNESSEE MUNICIPAL LEAGUE (TML) will be held June 11-14 at the Gatlinburg Convention Center. We hope that all of our clients and friends will visit us at the Ice Cream Parlor. This event gives our firm an opportunity to express our gratitude to all those who serve Tennessee’s communities. The annual WATER PROFESSIONALS CONFERENCE (the joint meeting of the KY-TN AWWA and WEA) will be held at the Knoxville Convention Center in Knoxville, Tennessee, July 17-20. Our Ice Cream Social is expected to have many participants and we certainly hope to see you during this year’s event! The Semi-Annual Report for the Pretreatment Program is being prepared for submission. A Sewer Master Plan and Corrective Action Plan have been completed and submitted to the Owner and appropriate regulatory agencies. A report for a 2016 Community Development Block Grant Sewer Rehabilitation project was submitted to ECD and announcements are expected Fall 2016. The Automatic Read Water Meter System Phase 2 project is 55 percent complete with a scheduled completion date of August 22, 2016. Baird Contracting is the Contractor on this project. Analysis of the Peak Wastewater Diversion Pumping Station to determine methods to optimize the station performance is complete. Cost estimates have been provided to the Owner. The Capacity Assessment Plan, Sewer System Evaluation Survey Work Plan, Fats, Oils and Grease Control Program, and Sanitary Sewer Overflow Response Plan are complete and approved by EPA as part of the Administrative Order of Consent. Work is underway on the Capacity Assessment Report. A pre-construction meeting for the Carters Creek Pumping Station Renovation was held February 18 with the Contractor being Cleary Construction. The $651,000 project is expected to begin during the summer due to timing of pump delivery. Construction for the Holiday Drive and Lantana Estates Water Line Replacement Project, which consists of the replacement of 19,000 L.F. of 6-inch asbestos cement water line, has a commence work date of April 25. An alternate bid of $1,115,386.95 was chosen to allow for water lines to be installed under driveways by boring, rather than by open-cut. A Community Development Block Grant was awarded for Sewer System Rehabilitation, in the Kayser Roth area, in the amount of $449,596. A bid opening is scheduled for May 24, 2016. Work on the Hwy 27 North White Oak Road sewer lines is ongoing. Currently, the Contractor is laying sewer line. The new 200,000 gallon Clarkrange Elevated Tank project, with the low bidder Phoenix Fabricators and Erectors at $610,717, is under construction. The old tank has been demolished and the site is ready for new foundation construction. The Highway 127/62 utility relocation project through TDOT has a letting date of March 2017. A semi-annual report for the pre-treatment program has been submitted. The NPDES Permit renewal is complete. 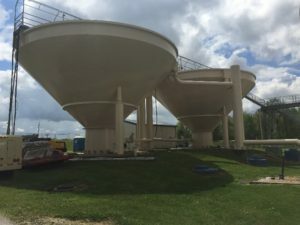 The $10.5 million North Wastewater Treatment Plant expansion is nearing completion with all new unit processes in operation. Work remaining to be completed by Codell Construction of Winchester, KY includes construction of the Final Clarifier No. 1 and No. 2 Return Activated Sludge Control Structure and miscellaneous piping. 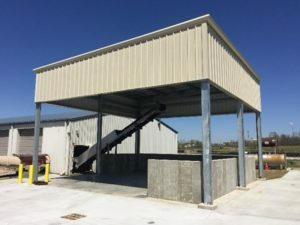 Construction of the South Wastewater Treatment Plant sludge storage building was completed by Deig Brothers of Evansville, IN. The conveyor system is scheduled for startup the first week in May. Design is underway for replacement of the Atkinson Park and Myrene Drive Sewage Pumping Stations including new 18-inch and 12-inch force mains. The Geotechnical Report is complete and the Owner is acquiring easements for the force mains. Design of the South Water Treatment Plant Renovation is nearing completion. This project includes a new 4.0 MGD GE Water and Process Technologies Membrane Filtration System, Flash Mix Structure, Solids Contact Clarifier, and GAC Contactors. Construction of the South Water Treatment Plant pad mount transformer was completed by Timmons Electric Co. Inc.
Painting of the South Water Treatment Plant Conical Clarifiers was awarded to Sam Estes Painting of Maceo, KY in the amount of $164,025. Exterior coating work is complete and cleaning and coating of the interior of the conical clarifiers is underway. Work on the interior of the clarifiers is being completed on the weekends during periods of low water demand. Work for the $525,000 CDBG Sewer Rehab project is completed and closed out. Gary Allen Construction was the low bidder for the ARC/SRF project for Lewis County and Hohenwald that extends a 6-inch water line approximately 28,000 L.F. along Summertown Hwy. The low bid was $427,681.83 with the project scheduled to be complete October 2016. Contractor has installed 20,500’ of 27,980’ of line and is waiting on an approval from the state for a change order. A semi-annual report in reference to the pretreatment program is in progress. Report for a 2016 ARC grant was submitted to South Central Tennessee Development District for Water System Rehabilitation. Report for a 2016 Community Development Block Grant focusing on Water Rehabilitation was submitted to ECD and announcements are expected Fall 2016. Construction on Phase 7 Priority No. 2 Sewer Rehabilitation Project is complete with the exception of punch list items. Additional work was added to the original contract. Plans and specifications for Priority No. 3 Phase 7 are complete and being submitted to the Owner. The U.S. Highway 41A water line project, which consists of approximately 15,300 L.F. of 20-inch water line to increase flow and pressure at the Interstate 24 interchange, in the amount of $1,659,958, is in service. A Final Water Model Summary Report was sent to the Owner related to planning level improvements to the water system. Design is expected to begin soon for sewer extension to benefit Farm Credit Services and future growth. The High Service Pump Replacement project is complete and closed out. An evaluation of the Wastewater Treatment Plant and rate study are underway. The 2015 CDBG Project for the Lagoon Aeration System and Sewer Rehabilitation project was awarded to SDT Contractors in the amount of $503,724.50. The design of SRF Funded improvements at the Miller Avenue Wastewater Treatment Plant is approximately 95 percent complete. A $13.3M Disaster Community Development Block Grant was recently awarded for five separate projects including Miller Avenue WWTP work, sewer line replacement and rehabilitation, sewage pumping station renovation, and dual South Fork Forked Deer River utility crossings. Design is complete for the OK Road and Coffey McGee Road Water Line Extensions and Plans were submitted to Owner. Gilispie Construction was the low bidder on the Cornersville WWTP Sludge Holding Tank with a bid of $119,000. Commence work date is scheduled for May 2 and the project has a completion date of July 31. Plans and specifications for the State Route 50/431 Utility Relocation have been submitted to TDOT. The project has been postponed until December 2016. 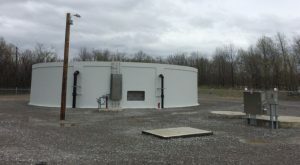 Design of methanol and coagulant feed and storage facilities to enhance nutrient removal is underway and the geotechnical work has been completed. A report for inclusion in a 2016 CDBG Sewer Rehab project was submitted to ECD and announcements are expected Fall 2016. Design for the Snell Branch SPS Renovation is underway and progressing well. The last Annual Report for the Enforcement Action has been submitted to TDEC and completes the obligations of the order. A WWTP Nutrient Optimization Plan was submitted to TDEC, late summer 2015, which resulted in a revised NPDES Permit. Further monitoring will be performed to confirm optimized plant operation. Design is complete for approximately 3,500 L.F. of sanitary sewer line replacement in the Madison Square area and has been submitted to Owner for submission to KDOW. We are developing a water model to assist Madisonville in determining the efficacy of proposed system improvements. Water Quality Modeling work is underway to determine the impacts of a reconfigured effluent discharge concept. The intensive field sampling is complete and calibrated model preparation is nearing completion. Survey is complete and design is underway for the 21,000 L.F. of 3-inch and 4-inch water line on Baizetown and Cave Ridge Road. A bid opening is scheduled for April 28 for Phase I Improvements, which include 15,876 L.F. of 16-inch North Transmission Line. Construction of the Cook Street Sewer Basin Storage Facilities is complete and closed out. Lastly, a study of the current anaerobic digestion process at the WWTP is underway. The Johnson Controls Pumping Station and Sludge Pump Replacement project was awarded to Richland, LLC in the amount of $233,000 with a commence work date of July 11. A report for a 2016 CDBG Raw Water Intake Improvements project was submitted to ECD and announcements are expected Fall 2016. Technical assistance with the pretreatment program is ongoing. Phase I of the TDOT State Route 128 road widening is under construction. This project includes relocation of water, sewer, and natural gas utilities. Barsto Construction is the Contractor and the scheduled completion date is July 2016. A semi-annual report was provided for the pretreatment program. A Community Development Block Grant for water plant improvements was awarded to Quinn Construction in the amount of $271,740. Portland Utilities Construction received the contract for approximately 2,000 L.F. of 12 through 18-inch sanitary sewer line rehabilitation in the amount of $337,932. TV camera work has been completed along with manhole repairs. Lining of the sewers is underway and has an expected completion date of June 12. Design is complete and plans and specifications are being reviewed by ECD for the renovation of the 2.16 MGD SBR Wastewater Treatment Plant, which recently received a Community Development Block Grant in the amount of $525,000. Local Limits have been adopted by the Owner and submitted to the State. Flo-Line Construction was the low bidder for the Main Street Gravity Sewer Replacement Project with a bid of $227,116. The Capacity Assessment Plant and Engineering Report for the WWTP has been completed and submitted to TDEC. The design of the 2015 Community Development Block Grant that will include improvements at the WWTP is complete and under review by ECD. The design of a new wastewater treatment plant has begun. Design work to replace an 8-inch waterline on Martin Luther King Drive is complete. NPDES Permit reapplication has been completed and Local Limits were submitted after TDEC reviewed and commented for final approval.